Luxury vinyl flooring is the best option for the customer who needs exceptional durability, and also craves the natural splendor of radiant wood floors. Unlike vinyl options of the past, these technologically advanced designs are made to look like various types of high-end classic flooring options. They offer the look you want, along with the superior durability of vinyl. CoreTec offers an innovative vinyl design which incorporates multiple new construction techniques. The results are a softer, quitter, more durable, and more attractive flooring result. Shaw offers its VersaLock edge, which allows installers to lock planks together instead of adhering them to the subfloor like older styles of vinyl. Our other brands each provide unique advantages that our knowledgeable staff is happy to discuss with you while you’re choosing your ideal flooring materials. Relying on our experts for your luxury vinyl flooring installation is the best way to protect your investment. We only hire the most experienced and skilled installers to be a part of our team, because we want you to be as confident in our dedication to excellence as we are. To further ensure your peace of mind and the performance of your new floors, we offer all our customers our Lifetime Installation Guarantee. That means we’ll fix any installation-related problems that you may have during the lifetime of your floor – and we’ll do it at no charge to you. Luxury vinyl tile is made to resemble high-end flooring favorites such as ceramic, porcelain, travertine, and marble, just to name a few. The individual tiles allow for an outstanding range of design creativity during the assembly and construction of your new floor. You can match different shapes, size and patterns to suit your own aesthetic. Some types can even be installed with grouting between the tiles. 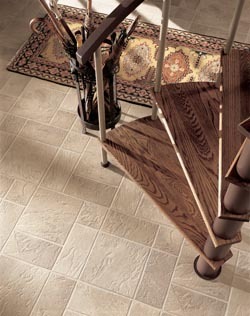 Vinyl tile also provides an easy-to-clean surface that’s ideal for busy or high-traffic homes. The outstanding durability ensures that wear and tear won’t be an issue, and you don’t have to spend the same amount of time on routine maintenance either, because upkeep is simple and stress-free. Luxury vinyl plank flooring imitates the size, shape and appearance of different wood species. There are many varieties of stains, grains, and finishes that we are able to provide in this style, so you are certain to find the luxury plank product perfectly suited to your design plans. Each plank distinctively textured to provide the feel of genuine wood flooring. Once the vinyl planks are installed, it’s nearly impossible for even a trained professional to tell the difference. Contact us today to find out more about how LVT is right for your home. We proudly serve customers in Gurnee, Illinois, and the surrounding Lake County, McHenry County, and Northern Cook County areas.